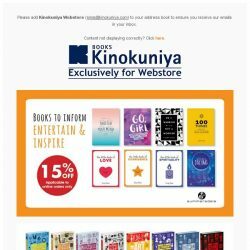 1 - 7 Apr 2019 Kinokuniya: Enjoy 12% OFF on All Books Online This Week! 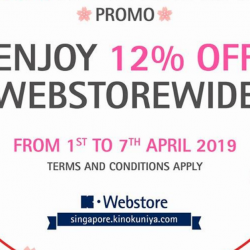 Enjoy 12% off WEBSTOREWIDE exclusively at Kinokuniya Webstore from 1st to 7th April 2019! Shop now! No membership required. Spend S$35 to qualify for free local shipping! 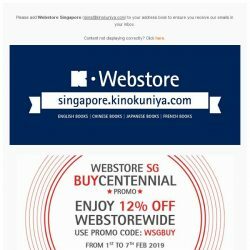 [Books Kinokuniya]  Enjoy 12% OFF WEBSTOREWIDE from today until 7th April 2019, exclusively on Kinokuniya Webstore Singapore.  Shop NOW! 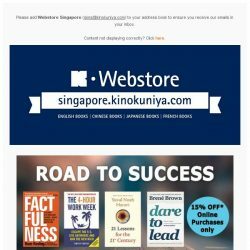 [Books Kinokuniya]  Set out on your Road To Success with 15% off, exclusively on Kinokuniya Webstore Singapore.  Shop NOW! 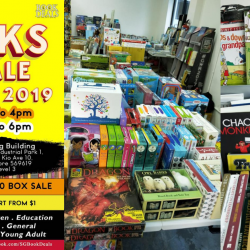 SG Book Deals: Book Warehouse Sale 2019 with Prices from $1 & All-You-Can-Fill $50 Box Sale! The news you've all been waiting for! SG Book Deals' Books Box Sale is back from 8 to 16 Mar 2019! Grab books starting from only $1 or fill up all the books you can in a box for $50! Please note that the operating hours for weekdays differs from the weekends. Share this news with your bffs! [Books Kinokuniya]  New Year, new opportunities! 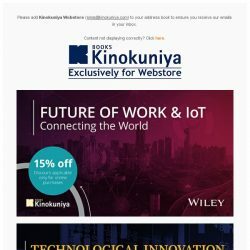  Enjoy 15% off Wiley’s innovation titles exclusively on Kinokuniya Webstore Singapore.  Shop NOW! [Books Kinokuniya] It’s the WEBnesday After Christmas! 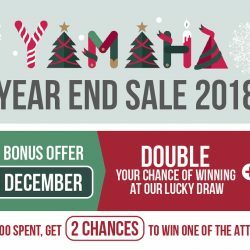 ⏰24 hours only promotion for 15% Off* WEBStorewide on 26th December 2018 ONLY!  Shop NOW! 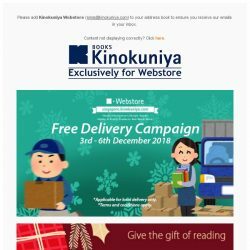 [Books Kinokuniya]  Enjoy *Free Delivery for limited period, exclusively on Kinokuniya Webstore Singapore!  Shop NOW! 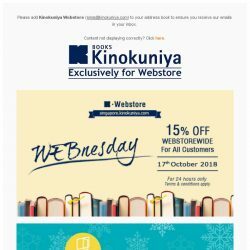 [Books Kinokuniya]  Enjoy 15% off Webstorewide this Black Friday to CyberMonday, exclusively on Kinokuniya Webstore Singapore!  Shop NOW! 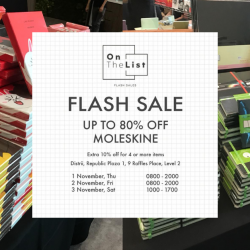 From 1 to 3 Nov, find a wide selection of classic Moleskine notebooks, travel accessories, writing tools, organisers, bags and more, at up to 80% off at On The List's flash sale! Also get MISCHA bags which is known for its signature hexagonal prints at up to 70% off at the sale! 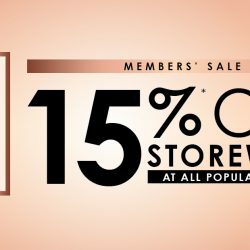 From now till 14 Oct, POPULAR members enjoy 15% off storewide, which can be applied on top of selected products offering up to 40% off. Not a member yet? Join now! Sign up or renew your POPULAR Membership at 15% off! [Books Kinokuniya] Christmas Shopping STARTS NOW! 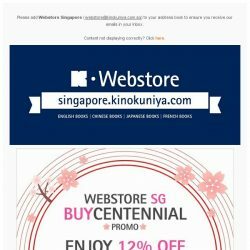 15% discount on selected titles, exclusively on Kinokuniya Webstore Singapore. Shop NOW! ​Grab 10% off on new textbooks at Amazon and use this coupon code for 10% off! Valid with min. spend of $100. 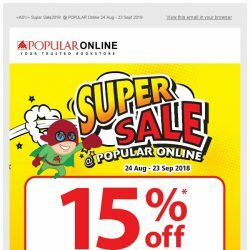 [Books Kinokuniya] ⏰ 24 hours only promotion on 19th Sep 2018! 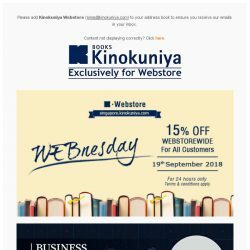 Enjoy 15% off WEBstorewide, exclusively on Kinokuniya Webstore Singapore! Shop NOW! 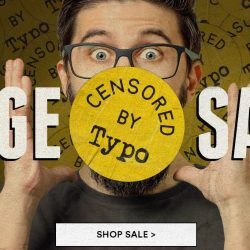 Get supercool gift ideas, fashionable stationery, awesome room-bling and other irresistible products from Typo at their huge sale with up to 50% off! Online and in store for a limited time only. 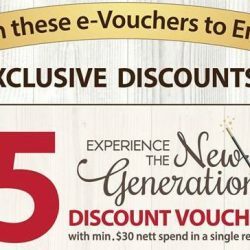 Till 9 Sep 2018 POPULAR: Flash These e-Vouchers to Redeem Up to $20 OFF Your Purchase! GRAB YOUR $20 VOUCHERS NOW!!! Power up your weekend with EXCLUSIVE DISCOUNTS at POPULAR New Generation stores in 15 locations. Simply FLASH this voucher below when you’re making your purchase at any participating New Generation store to redeem the discount. 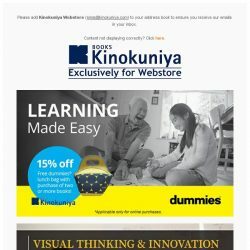 [Books Kinokuniya]  Books to inform, inspire and entertain. Enjoy up to 20% off selected titles, exclusively on Kinokuniya Webstore Singapore! Mark this down on your calendar! 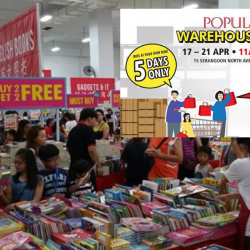 POPULAR Warehouse Sale is back with the English, Chinese & Malay BOOKS BUFFET! Take your favourite books home at unbelievable prices. 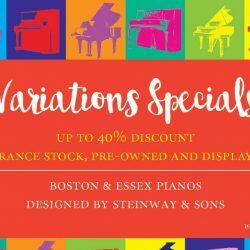 Also, don't miss out on the other juicy offers for stationery, music, and Gadgets & IT products! BREAKING NEWS: World of Sports will also be serving up great discounts up to 90% at the POPULAR Warehouse Sale! Share this great news with your friends now!